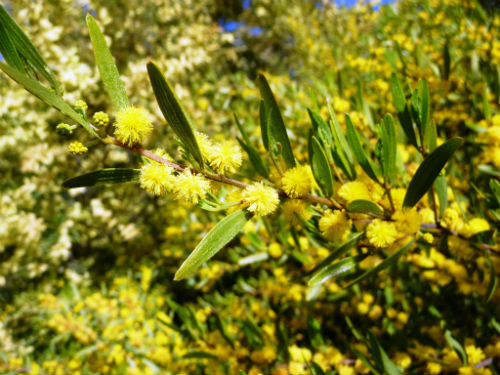 Acacia ixiophylla, Sticky Wattle, is a medium, upright shrub. The phyllodes are sticky and about 30 millimetres long by 6 millimetres wide. There is a gland near the base of each phyllode. Bright yellow, globular flowers appear in spring. A pair of blooms is carries at the base of the phyllodes. Flowers are followed by slightly curved sticky pods that are up to 7 centimetres long. Foliage, flowers and pods are all attractive features. A. ixiophylla is frost tolerant and, once established, has low water requirements. This would be a useful shrub to include in shrubberies and hedges. A. ixiophylla occurs on the slopes, plains and tablelands of NSW as well as southern Queensland. The type specimen was collected by Alan Cunningham on the Liverpool Plains, NSW in the mid 1800’s. The species name means either similar to the genus Ixia or refers to the sticky nature of the phyllodes. Propagate from seed or cuttings. Seed should be soaked in boiling water before sowing.